Today is our fifth wedding anniversary. So I decided to re-post our love story. Young Wife’s Guide is dedicated to encouraging YOU where you are and I thought you might like to see a little bit of our story…Go back and read how we met, how we feel in love, and our engagement story. Now on to the moment you have all been waiting for (I know I was!! 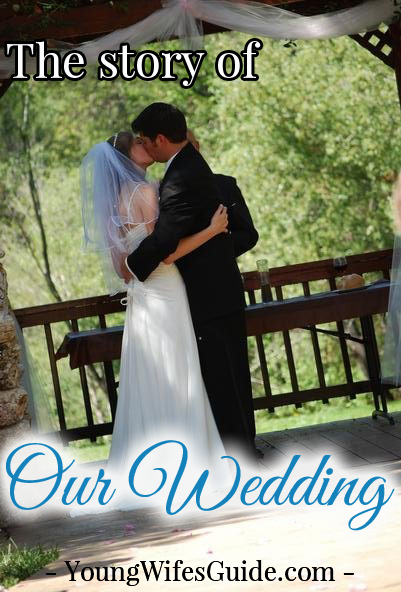 )– our wedding. We had the perfect and most beautiful wedding (even if it was over 100 degrees and sweltering)! 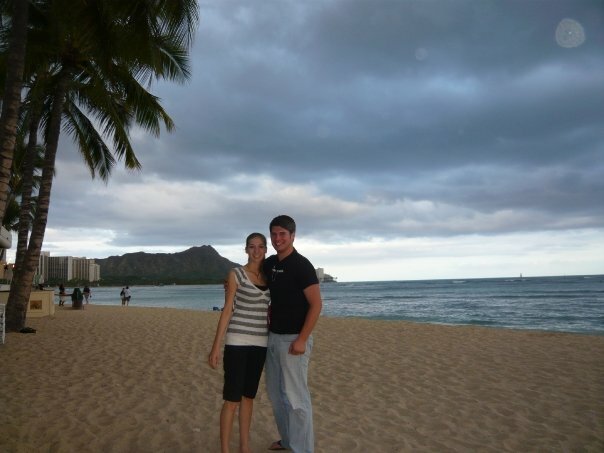 We got engaged on October 17, 2008 and got married exactly 7 months later (who needs a long engagement??) on May 17, 2009. We were away at college at the time (8 hours away from our family). But we just knew that we had to get married back home. Away at college, I started our wedding planning with hours of research online. Over Thanksgiving break we did a few beginning things such as taking our engagement pictures and visiting a few venues. But then over Christmas we did the bulk of the wedding planning. If someone tells you that you need at least a year to plan a wedding, they are crazy! We had 7 months and never felt like it was too rushed. We just figured out what we needed to do and did it! Over our three week Christmas break we picked the venue. It just had to be outdoors. I don’t know why but the idea of a lush garden could not get out of my head. Well due to our budget we couldn’t find an actual garden but I ended up falling in love with our venue. It was an iris garden on one slope and a beautiful pond below the site. We also picked my dress over Christmas break. I ended up picking the third dress I tried on. Loved it! At my final dress fitting a couple weeks before the wedding! We picked the wedding invitations and pretty much got everything ready. Over the next several months I planned the wedding from 8 hours away with lots of help from my mother and my in-laws. Over Easter, I had my final dress fitting and finalized anything else we had left. We went back to school for two weeks. We had our finals week and then I was home for a week and then it was our wedding. It was definitely a busy time and it made it hard to focus on finals with my wedding a week away, but it was so worth it in the end! We got married on May 17, 2009. I was 19 and he was 21. Yes, we were young and married and our wedding was absolutely perfect!! Our families came around us and supported us more than we could have imagined. Our friends were also so supportive and we had the perfect wedding day. Are you a young married, or were you married young? Share you story with us. I always LOVE to hear about young marrieds and hearing the stories about how God brings two believers together in holy matrimony. Leave a comment here and let me know how you got, met, and married your love or leave me the URL to a blog post you wrote about your love story. I LOVE wedding stories!!! In fact I have a romance spotlight once a week on my blog and feature someones story too. I would love to feature you if you are interested. I have shared mine and you can find it here: http://fridaynightdatenight.blogspot.com/2012/02/romance-spotlight.html I was 19 when I got married too! Best decision of my life! Yesterday, I wrote a post about how my husband and I met, our engagment and wedding. I tried to keep it short since I only did one post, but it explains the important parts. We were married pretty young, I was 19 and he was 20. That doesn’t matter, we’re more in love today than then and we LOVE being married! Great series by the way, I love to hear Love Stories! Hi Sandra, SO glad that you stopped by! I just went over to your blog and read your story. SO cute!! Your “Dating” time was so short lol. We were 16 and 18 when we met so I have always said that if we were older we wouldn’t have dated as long and got married sooner. I have a feeling we would have been more like you guys. I can’t wait to hear part three! I’m going to put together a post with cute love stories (and include yours) soon! I just need to find the time 😉 Please do share mine if you want too! Hi there! What fun to hear your love story and see your beautiful wedding photos. 🙂 My hubby and I have been married for 13 years and we weren’t as young but definitely young by the world’s standards (22 and 23). I wouldn’t trade it for anything in the world and I’m so grateful that God brought us together in His perfect timing! We have been through A LOT but have weathered the storms with love and commitment and FAITH. Thank you so much for sharing your journey with us at Inspiration Friday this week! Hi! I hopped over here from Intentional By Grace. Love your blog! My husband and I met, began dating, got engaged, and married all in the span of 21 months. We also had our first baby a little over 9 months after we got married… God loves to give us BIG surprises 🙂 We were 21 and 23 when we got married. I have started to blog our love story and will finish it up with our engagement and wedding stories on their anniversaries at the end of this month and the end of August, respectively. I would love for you to visit and read our story! Hi Faith! Thanks so much for stopping by! I am so glad that you came over from Intentional By Grace! I am I jsut went over to your blog to check it out and I can’t wait to read more later. I read a bit about how you met your husband, so sweet! I need to read more later when I have time :). I found your website through Jaimie Ramsey (we went to college together). Praise God for the way He works. Hi Kortnee!! So glad that you found your way here! 🙂 Congrats to the newlyweds! I’m so sorry! So many in our culture don’t realize what being married young means and what a blessing it can be. That’s why I love being online and hearing everyone’s stories! My husband and I were married when I was 20 and he was 23, nearly as young as you two. We are now 25 and 28. We met in at a Christian college. We both started the same year because he had chosen a different career path, then changed his mind and came to the Christian college. We got to know each other just hanging out in the lobby with friends and going out in groups. He finally asked me to the movies and we began dating. We married about 2 1/2 years later. We lived at the college for a while, and now that he has graduated, he is now working as a facilities director for a church part time while he works full time for a nationwide retail store. I also work full-time so that we can work on paying off his student loans (we recently stared Dave Ramsey’s Financial Peace University, so we are trying to pay off all of our debts). No children yet, but we both have a heart for kids. We are actually thinking about starting foster care because there are so many kids that need homes. Anyway, that’s how we met. Even though you are younger than me, I find your blog inspiring and hope to learn more as I read more about you and your husband. Blessings to you! Jami, I love your story! I especially love that you are both Christians. As you know, the only way to have real love, peace and satisfaction that lasts is to trust Jesus Christ as your savior. My husband and I met when we were ages 15 and 16 then married when we were both barely 20 years old, and we will celebrate our 36th wedding anniversary this year! How beautiful! It’s so rare that I find other young brides out there. I am 19 and getting married next month on the 30th. My parents were married at 19 as well and celebrated their 20 year anniversary last year! My fiance and I met when we were 14, began dating at 16, got engaged at 18, and will be married at 19. I have a wedding blog currently, and am starting up a new blog next month for young wives that is in the design process right now. I would love to link up somehow! I know! It is very rare!! Congrats on the upcoming wedding! You will soon enter the beautiful blessing of marriage 🙂 Your blog is so cute! 🙂 Thanks for stopping by and let me know when your young wives blog is up!! Can’t wait to read it! Woops..hit post before I was finished. I have a series going on right now: Share Your Story all about young wives stories. When you get your new blog up (or now) you are welcome to submit your story to feature in this series 🙂 I would love to read it! This was exciting to read. You met at 14. My 13 year old daughter has met a wonderful young fellow 15 at a church camp. They have been texting/messaging daily for 4 months, they get on so well and it has been a God honouring relationship. I am scared for them because they are so young and I really hope it works out for them, but it is such a long time before they could get married. It is obvious that the both have the hopes that the friendship will end in marriage. (My husband and I met not long before we stated dating and dated for about 6 months before we got engaged and then struggled to stay pure during our engagement (10months) I was 19 but he was 25.) My daughter and her friend live three hour drive apart, which is actually a blessing at this stage of their young relationship. Him and his siblings are visiting in a couple of weeks. He will move closer in 2 1/2 years to go to uni. I am probably just getting carried away with it but how young is to young to marry? 16? 17? Just wondering what your thoughts are on this. (They are both homeschooled, have part time jobs, he has aspirations for his career, all this, just to say, they are both quite mature for their age, and both are often mistaken for being older then they are. I commented over at Nicole’s guest post today but would love to share here again! We were engaged when I was 20 and married when I was 21 (my other post said Ryan was 23 but he was 24…oops!). It was the thrill of our lifetime to see God moving so far outside of what we would have ever thought. The kicker to our story is that just a few weeks after we were married we move to Saudi Arabia to begin our life together. God does amazing things through young people and couples. Praise Him! Love your story – I find it amazing how God brings people together. I was a young bride as well. My husband and I met when I was 18 and he was 23, were engaged at 19 and 24 and married at 20 and 25. (I alway joke with him that while I was a young bride, he was OLD at 25 LOL) We met while attending a Christian University. We will celebrate our 13th anniversary in Feb of 2013. Even though you’re young doesn’t mean you can’t have a long and happy marriage. If often think that there are advantages to being young when you marry because you have a chance to “grow up” together. You learn about life as adults together and that forms a bond that can’t be broken. So after almost 13 years, and 2 wonder children my husband and I are still as in love as the day we married! What a sweet story Jami. Love reading about other young married couples. My husband and I got married a month ago on June 17th both at the young age of 20. We met at work as well after the Lord had strategically placed me right where he wanted me and way out of my comfort zone. We met February 2011 and started dating that May, Got engaged January 2012 on my birthday in my favorite place and after many trials and older people questioning our age, we were blessed the most beautiful perfect wedding of my dreams with the support of all our family and friends on June 17th. The Journey has just begun and I am excited for the I good and tough times the Lord will set before us. I love being a homemaker and wife. What a sweet story Ann Marie! Congrats on the marriage!!! The newlywed stage is such bliss! I am so happy for you and stick in there, the mean comments about your age will eventually go away when people realize what the Lord has put together 🙂 Thanks for stopping by!! What a sweet story, Jami Leigh! My husband and I met in college and were friends for three and a half years before I knew that he had liked me the entire time. I came back to school my senior year and he came over to help me move my furniture into my dorm room along with a group of our friends. We ended up sitting outside and talking for several hours. And that’s how our friendship blossomed into a romance – we spent a lot of time talking and getting to know each other. We were both Christians, and I kept feeling prompting from the Holy Spirit. One day he sent me a really sweet text message while I was doing homework. I remember dropping my homework and squealing and then asking him to meet me. When he came over, it was starting to rain, but I didn’t really care. I gave him a big hug and then asked him if he liked me. Well, he, of course, did, and we spent the next several hours talking about what our relationship was going to look like since we were both seniors and wanted a serious dating relationship intended for marriage. We dated nine months, but on month 3 I knew I loved him. During that time, I expected him to pop the question around his graduation, but when it didn’t come, I figured he was waiting until I graduated. (I had to go an extra semester.) We both stayed in our college town for work that summer. About a month after his graduation, he picked me up to take me to my church since I hadn’t been in several weeks because I didn’t have a car that summer. Then he took me to an arts festival on the waterfront. It was a wonderful surprise because I loved art and he wasn’t too artsy. We had dinner with friends and then headed back to his apartment where his parents stopped by “randomly.” I thought something was up, but I wasn’t sure what. We were watching Spider-Man 3 when I made a comment about how when he proposed he wouldn’t butcher it like Peter Parker did in the movie. Little did I know. After the movie, he went and got me a bag of gifts – a beautiful jade flute from Japan, a box of chocolates, a singing card, and a few other small things. Then I found a silver box at the bottom of the bag. Inside that box was another box and inside that box was another and so on until I came to the ring box. When I opened it, suddenly out of no where, Switchfoot’s version of Only Hope starts playing. (My favorite band). He asks me, and I started laughing. I don’t know if it was nervous energy or genuine joyful surprise! Anyway, he had to ask me twice… poor guy! But of course, I said yes and we danced in the living room. The ring had been made from a mold of his mother’s wedding ring, but mine is larger and has two of my favorite stones in it, shaped like a flower in our two favorite colors. It’s perfect because my wedding band slides right under it and so I can still wear my engagement ring all the time. The next six months were a whirlwind as I finished up school, worked three jobs, did marching band, and tried to plan a wedding. But God is good and I managed with His help. We were married at my church on December 31st by our college fellowship Bible study leader (which was really special since he had moved during our junior year), and had the reception at my husband’s church. I was just barely 22 and he was 23. It was a beautiful wedding, but of course, I’m biased. As soon as I walked down the aisle and laid eyes on my husband I knew I was marrying the most handsome man in the world and my nerves fell away. It was such a fun, memorable, and special day, and we even, sci-fi nuts as we are, entered the reception to the Imperial March from Star Wars as a special inside joke with a light saber arch. And then we spent our honeymoon relaxing in Ocean City, Maryland. Personally, I believe “if you know, you know. why wait?” If God has brought the two of you together and you know that you’re going to get married, don’t drag it out unless you absolutely have to because for one, you avoid and help prevent temptation and two, life is short , and three, life is so much better together! I don’t regret my decision to get married young (I’m still young) and being young, in love, and married is so wonderful. I have such an amazing godly husband and I wouldn’t trade him for anything in the world. God has been so good to us and I only hope and pray that other young married women get to experience the love and devotion of a husband who’s head over heels in love with Christ and them like I do! Hey! I am super excited about coming across your site. Actually, it was Sheila (To Love, Honor and Vacuum) that mentioned it. We seem to have a bit in common and so I’m keen to get reading your posts. I married when I was 21 years old, and my hubby, 22. He is from Kansas, US, and I am from Adelaide, Australia. We started talking on a Christian forum site when we were 16 and 17 years old. Living in entirely different hemispheres, we never thought we’d meet. Therefore, there was no point in even thinking about anything romantic (boy did I wish he was in Australia though!). This freed us up to get to know each other on a deep level without us only putting our best out there first. God really used our friendship to point us as individuals, towards Him. Before we knew it, we were the best of friends. After being such great friends for 4 years, we thought “hum… maybe we SHOULD meet”. In 2008, my best buddy flew all the way to little ol’ Adelaide, and stayed with my family for 3 months. After getting to know each other in person for a couple of month, we decided that yes, we do want to pursue a relationship/future together. Numerous flights, trips, visas and 2 weddings later: we have now been married for a little over 2 years, and are both currently living in Australia. We love marriage, and are so grateful that God has been so kind to us. I am so glad that you stopped by! 🙂 Wow!! What an interesting love story. I always love hearing about how couples find each other. How neat that God works that way!! A friend of mine shared your facebook pic, of your twins, with me. I am currently pregnant with twins, due this summer, and I love connecting with other twin moms. I came over to your blog and read your story. So, I thought to share with you that I, too, was a very young wife. 🙂 I got married at 19 and my hubby was 20. We have now been married for 10 and a half years. It has been a very challenging learning experience; but God has never let us down. He has blessed us beyond what we ever imagined, over the years! I’m glad my friend shared the picture of your precious babies! Congratulations on your new bundles of joy. I look forward to following your journey. I was home after an entire year at college. On the way home, my mom complained none of the youthgroup had welcomed a new person to the group. So I looked him up on facebook and sent him a welcome message ’cause I really didn’t feel like talking to him in person. From that day we emailed for the entire seven months he was in Iraq. When he returned, he wanted to come over to my parents house and actually meet in person. We did. Five months later, a year and a week after we had started talking, we eloped. Not the brightest idea, but our intentions were innocent. Two weeks after we eloped, he was gone again on his second tour to Iraq. When he returned seven months later, we discovered what marriage together was like. Nine months later we welcomed our oldest into the world. We aren’t romantic at all, there was no proposal, no dating period, ect. Being separated the first 7 months of our marriage then having three kids in the following 32 months, we joke that we’ll have our “newly married” experience when the kids leave for college. I love your love story! I want to share mine and my husbands love story with you. I feel like you will appreciate it! My husband, Adam, and I went to two separate high schools. He went to a private school and I went to the public school. He went to church with several of my good friends from school and even dated one of my best friends but somehow we NEVER met. If we did neither of us remember it, we just knew who one another were. High School ends, he graduated in 2001, I graduated in 2002. He went to a Christian College a couple hours away and I stayed home, attended community college and had several odd jobs. (All I wanted to do was be a wife and mother, I just didn’t know it yet.) Early 2007 Adam moved home. At the time my now father-in-law (Doug) was the Pastor at a small church that my Grandfather was a Deacon at. Adam had become involved in another church in town and I was also involved in another church in a nearby town. Anyway, on occasion I would visit my Grandfathers church. Summer and Fall of 2007 my Grandfather started talking to me about his Pastor’s son. “He’s just a good ol’ country boy. You should meet him.” So on and so on. My Grandfather NEVER showed interest in the guys I had dated before! While my Grandfather was telling me about this wonderful man, Doug was also telling Adam about me. Doug and my Grandfather had conspired together to somehow get the two of us together. But every time either of us would visit the church, the other wouldn’t be there. So finally I went to visit it one Sunday night in the middle of November 2007 and Adam wasn’t there. After service as I was walking out the door Doug stops me and says “Can I have your number to give my son?” Giggly and red faced I gave him my number. The next night Adam called me. It took a lot of pushing from Doug for Adam to call me but he did call. When my phone rang I didn’t recognize the number so I didn’t answer because I figured it was him. I got really nervous 🙂 but I did call him back and 4 months later we were engaged and 4 months after that we were married! Doug has told me several times that the first time he saw me God told him I was going to be his daughter in law. Many times I have asked “God why couldn’t we have met in high school?” But God has perfect timing and now I realize that Adam and I both had a lot of growing and changing to do be for God would bring us together. I love our love story! It’s the perfect example of God’s perfect timing! In the five and half years between high school and meeting Adam I faced many trials and my faith was tested. But I knew God had a plan! I had to go through that for God to shape and mold me into who I am today. Adam and I aren’t perfect but God has made us perfect for each other and together we are complete, lacking in nothing! Just wanted to share my love story quickly. Richard and I met September 2011 at youth group. Unfortunately at the time I was with the PK who had nothing but bad to say about my now husband. The whole youth group well I was with PK Richard would run ahead to hold the door, ran to help pull me up the zipline, picked up my dropped gum package and grab a plate for me when we were having pie. After youth group he asked me “someday may we go fishing?” I just politely shrugged the request off and walked away. Skip over several months of seeing him maybe 3 times at church and once at walmart and being left and trampled on by PK. In March 2012 I asked my friend Rita (I just recently found out she was Richards sister[very complicated family]) for her brothers cell number. I text him a few times daily and we finally got to meet up at DQ, since that first “date” we were basically inseparable, April 22 after asking my parents for my hand in marriage he got down on one knee after church and proposed.September 2012 we married and May 21 2013 we had our first son,(he wants 12 children.) We married when we both were 19. I look forward to reading more of your blog! Thanks Jami! That’s wonderful Rachel!! What a beautiful love story 🙂 I always love hearing other people’s stories! Glad you stopped by!! I love your story! I was married just after I turned 19. There’s 7 years difference in my husband and my age so he was 26. I honestly can’t imagine life with anyone else. I absolutely love our marriage! Getting married young is looked down upon so much, but when you know you know, you know? Wouldn’t have it any other way. We just celebrated our 2 year anniversary and we have twins on the way! I met my husband at my first job out of high school. After dating for three weeks he asked me to marry him. I said yes and we were married two months later. Thirty eight years later with three kids and one Grandbaby, we are still very much in love! Wow, I’m getting married in just a few days also on May 17th- So happy to find your blog 🙂 Thank you for all the material and great thoughts you’ve shared! We also had a short engagement. We were engaged 9-27-10 and married 12-31-10. We knew we wanted to marry each other, so we decided to do it sooner than later. It is wonderful to hear the love the Lord has brought for you and your husband. I enjoyed very much reading your blog! I love hearing love stories specially those that end up in marriage! I am 22 years old and my soon to be husband is 23 we are due for marriage in september!! I couldnt have been more excited! We met when we were just 17 and 18 years old. Although things have not been easy i can clearly say that the Lord has been our strength and is crazy enough for other people to understand but my soon to be husband n i know that God brought us together for a purpose. Many questioned our decision since the beginning but we both knew it was the right thing to do. I am so grateful for him, and i would love to share little bit of my story with you! Indeed this encourages many young couples! And i believe that when it is a calling from God, there is no power on earth that can stop it! Thanks again for sharing! My daughter is 16 (going on 17 in December) and her boyfriend spoke with my husband yesterday about wanting to give her a promise ring. My husband said he could but that he could not propose until she was 18. I am happy for our kids and think they are absolutely made for each other. They are basing their relationship on the Lord and are very open with both sets of parents about their relationship and their intentions. I am curious about the response of your parents and how they handled the nay sayers…we have already encountered this with the very small number of people we have confided in. Thank you for sharing your story! It really is beautiful! I love this post. I thought you might like to hear from someone who was married young and still going strong nearly 24 years later. My husband and I married while still in college in 1991, so it’s not like we are from the generation where it was just the thing to do to marry right out of high school at 18-19 (I’m thinking the 50’s and 60’s). It was more the ‘norm’ to get out of high school, go to college and THEN think about marrying/settling down. My husband and I were one of the first of our friend group to marry but did have quite a few to follow suit within a year or so of us so we like to think of ourselves as young marrieds ‘pioneers’ during a time it wasn’t exactly what everyone else was doing. I have written about this and my wedding, but have since closed that blog. I could always share it to you in an email or however you’d like to hear ‘my story’. We are believers, and feel that was a HUGE part of our deciding to marry when we did. The unique thing about my story is that we are now parents of adult children – ages 19 and 21 (going on 20 and 22) and they are both in relationships that are/could very well be their life mate. Our daughter, in particular, and her sweetheart have been talking with us about this possibility (marrying while in college) but there are some circumstances that may make that difficult. My children and their significant others are strong followers of Christ, and want to honor the Lord in their decisions. Hence the reason I came across your blog post – I am looking for wisdom and advice/stories as I help to guide them. Thank you for your insight!!! Second, my husband and I married on June 9, 2012 – I was 21, and he was 37. We finally decided to marry after roughly a year as an “official couple” and a week’s notice – we had “the talk” on Sunday, and were married the next Saturday, in my parents’ backyard. It never felt rushed to me, either, and everything went pretty well in the planning department (though I still tease him about not proposing, and do NOT get me started on the events that took place after our vows). I was consistently asked if I was sure, and even after our vows I was told that things could be easily annulled if I wasn’t ready; mind you, at the time, we had a 4-month-old, so it wasn’t like we could just go our separate ways anyway, but something about my age just seemed to annoy people, and I think people felt that my husband was perhaps a Big Bad Older Man who was taking advantage of a Sweet Little Girl, instead of two people walking along the same path in life. I’m not sure what I’m trying to say, except that I kind of understand how you feel. 🙂 Plus, I love reading love stories. My boyfriend of nearly 5.5 years and I have been discussing marriage a lot lately. We are both going to be 20 this year. We met when we were 12 and “dated” on and off until we were 14 and then we decided enough was enough and we have been together ever since December 12th, 2009. No, no breaks ups! No one ever seems to believe that’s true. Anyway, marriage has always been in the talks since day one but in the past few months it’s become a real discussion of when we want to tie the knot. The biggest things holding us back and waiting is of course the worlds view and how people think young married couples are “playing” married and we just want it to be a happy time and we don’t want any scrutinizing. With this aside though, we are so ready! We have been living together for a year and a half, completely financially independent, and both have our college education completed. It tears me up because the social aspect of this is the only thing holding us back, I want our engagement to be a happy time without worrying what people are going to say or how their going to treat us. When I look back at making the biggest and most joyful decision, I want to feel nothing but happiness and remember nothing but love surrounding us. Any one else on the same boat? I am curious how you are going to be 20 (or I suppose at this point must be 20-21) and have already completed your college education? I know I am very late getting to this, but I wanted to reply anyways. I have always read your blog (from Pinterest), and I think your story is so cool. I am only 18 now, and I probably won’t be engaged for 2 more years. My boyfriend is 21. Other than that, our stories seem similar. My boyfriend and I met at McDonald’s where we worked when we were 17 and 19. Our first date was also in a coffee shop (after church) and we stayed there for over 3 hours talking. The only reason we didn’t stay longer was because I had a youth group dinner to go to. We aren’t away for college, but I did just get back from a 5 month study abroad trip. It was hard on the relationship, but with the help of the lord, we were able to work it out. Just because of college and finances, we don’t think we could get married in less than 3 years. The only problem is my parents. They got married at 29 and 32, and don’t really believe in marriage under 25. It breaks my heart knowing that my mom probably won’t be supportive when we do decide to get engaged. I wont say much right now. But I’m definitely following you. I’m inspired. Hi, Jami! I want to thank you for this blog! I love taking care of my family and learning from others, but I feel a bit lonely sometimes. I want to share my experiences with others, but there aren’t very many people going through the same things I am at this stage in life, so I was very excited to find your blog! It makes me feel much better to know that I am not alone, and I love to know that I am not the only one young and caring for my family biblically. My husband and I met on our first day at work at a grocery store. There were only three of us training for our new job at the time, and from the moment I saw him I wanted to talk to him, but I was just so nervous! I remember we had to do some training on a computer, and I sat right beside him and wanted a chance to talk to him so bad! The only thing I could think of was to ask him for a pencil, so I did! After our training, we didn’t really speak much. I would say hi to him sometimes, but he would act a little strange. I thought that he was a bit snobbish at first, but I still wanted to get to know him! I had made a friend at work that went to school with him, and she told me that he already had a girlfriend. I was sad, but I wished them the best. One day I was chatting with a boy who was a cashier, he had a small crush on me at the time, and my crush, AKA my future husband, walked up out of the blue to help me bag some groceries and just started talking to me! Our first conversation was about storm chasing, and I was so excited that he we actually got to talk. He started to loosen up, and when I would return groceries, I would try to be on the next aisle of him while he swept (he was sanitation), so we would get to talk for a bit longer. Eventually he gave me his phone number, and we began texting, too. He asked me on a date one day at work, and I gladly accepted after asking about his girlfriend. It turns out that he didn’t have one! I had gone this entire time thinking he did, when he really hadn’t! After our first couple of dates, he asked me out while I was on the bus to a football game. I told him, “I would love to!” What he texted me next I will never forget, “Is that a yes?” I told him yes, and was so happy that night! Two and a half years later, on May 3, 2014, we were married. December 9, 2014, we welcomed our first baby boy into the world, and the rest is history! We were 19 and 21 at the time, but we are both a year older at 20 and 22 now! So many people have told me how hard marriage is, but I haven’t found it quite that hard! Stressful sometimes, but not hard, because I know God is providing for us. My husband is my best friend, and I have found marriage to be so much better than when we were dating! It’s fun to grow together as we venture out into the world and take care of our family. God has done so much for us and has put it on my heart since day 1 to be a homemaker. Although I already had a small taste for it with my mom teaching me things as I grew up, I feel like I have learned the most actually experiencing it for myself. I am so excited to see what the future holds for us! Thank you for inviting me to share our story! your stories are wonderful. i am 18 and dating. my bf wants us to get married next year, our parents support the idea, but i was scared of people’s reaction. after reading your stories, i realise God’s plan is all that matters. I’m so glad! And so true – God’s plan is all that matters! My name is Reza. I currently am 16 and my girlfriend is 15, and we’ve been together for a year and a half. Sara and I pray together every day and always feel that God wants us to be together. I just wanted to tell you that your story was such an inspiration to me and I am on my way to sharing it with her too. Thank you so much and I pray that He will give you as beautiful of a life as I want with Sara. Thank you so much and feel free to email me at reza.usmani@yahoo.com if you’d like to talk more!